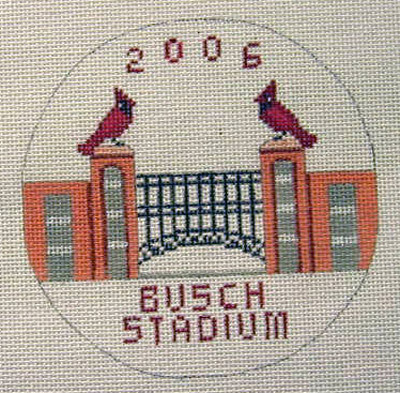 This is the 2006 version of the St. Louis Cardinals belt, on #18 mesh, featuring the brand new Busch Stadium which opened in April to rave reviews. Notice the Cardinal clock on the center field wall where Jim Edmonds plays and the imposing new entrance. It's awesome!! On a predominantly red and green plaid background are placed horizontal ovals featuring Xmas motifs centered by a "Merry Christmas" oval. Plaids are carefully stitch-painted on #18 mesh canvas. Have you noticed how every arm is adorned with bangles and cuffs -- of every imaginable design, material, and price point? From plastic to Svarosky? Traditional, yet updated, zippy and zany? I have worn a pair of amber and tortoise bangles as my jewelry of choice for milleniums; then I was eccentric; now I'm stylish! These cuffs come with an opening to more easily slip on your arm, are leather lined in choice of black, red, apple green, and include little seed beads to add your individual touch. Better stitched with a light weight black and/or taupe/white, such as perle, Splendor, Au Ver a Soie, so that the leather backing will be snug and not gappy. See description of black and white cuff. 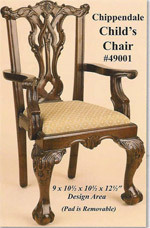 This child's chair is a reproduction of hardwoods with a mahogany finish. Dimensions are 15-1/2"w x 16"d x 25-1/2"h. Removable seat is handsomely upholstered in a synthetic brocade. Should you care to cover the seat pad in needlepoint or x-stitch or bargello, its dimensions are 9" across the back, 12-1/2" across the front and 10-1/2" along the sides (or deep). Wouldn't a grandchild look cherabic in this chair? On 18 mesh, Baroque angels in flight. #18. Designed for animal lovers, whimsical critters attired in their finest holiday accessories. 20" long with 9" x 3" cuff for name. Another view of desert clogs. 4 X 7" eyeglass case to accommodate those big UV glasses when not on the court. Stripes across top and bottom on top of which can be stitched in a contrasting color the name of your tennis club or courts. #13 mesh. In pink or blue colorway. On #13 canvas, these covers wrap around and adhere to night light covers, which are included along with the fixture. 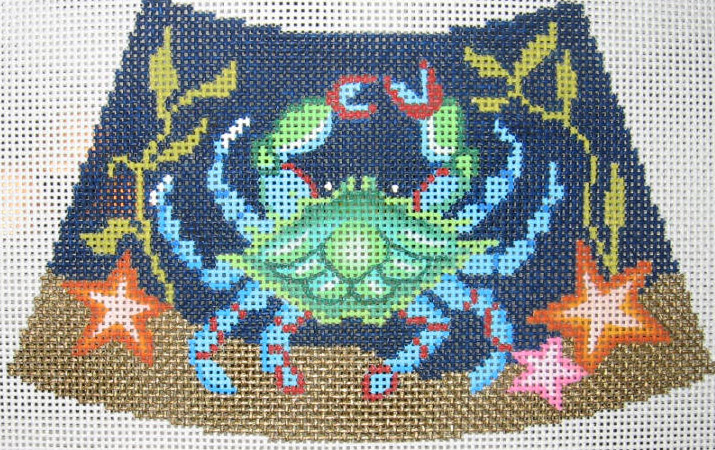 Great for a child's room or bathroom and little enough to stitch while waiting in the carpool line! No finishing required that you can;'t do yourself in a matter of minutes. #18 canvas. Entry facade of Busch Stadium, April, 2006. The St. Louis University Billiken mascot. #13 and #18 mesh. Same as below, only exhbiting a 1 letter or 3 letter monogram. This picture shows the design on #18 mesh. Tropical design of parrott and flora. Can be personalized with 1 letter or 3 letter monogram. Also comes on #18 or #13 mesh. One side. Would be dynamite stitched in dark green or, better, black! Line in red moire. This beautifully carved footstool, in the style of Louis XV is made of solid hardwoods with a deep mahogany finish. Very stylish upholstered in fabric (Pierre Deux?) or hand-stitched covering. Design area is 11-1/2" x 16;" pad size is 4" larger. Pad is NOT removable, so covering would be stapled on at edge line and finished with complimentary gimp or twisted cording. Size: 11-1/2" x 16" x 9" h.
On #13 mesh, this is a perfectly sized skirt to wrap around a potted Alberta Spruce on your dining table or coffee table. Soon to be corded, backed and tied in red plaid taffeta. Each little Santa is so jovial it's be ashame not to share him with your family and friends!